So which will it be? 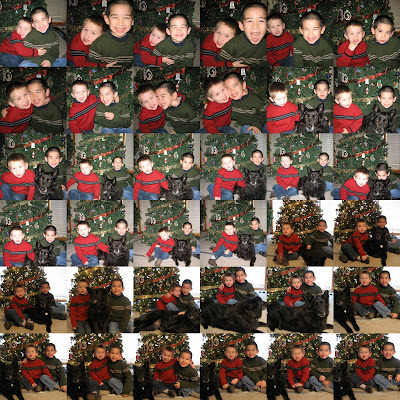 One of these pictures is going into the Vollmer Christmas Card….the boys, and Howie, were all great sports about it! Jacob has been inspired to help this year, which is great! He’s making stuffing for us here. Are We Hungry This Morning? This has to be a record for him — and I don’t mean the volumes of food. It’s a record for Timmy to eat such a variety of non-junk food! I’m guessing he’s in the midst of a growth spurt, he’s been falling down a lot lately. Stumbling on his own two feet, and his legs are covered in bruises. He also has a pretty nasty series of cuts in a vertical line down the center of his face, from tumbling down our 3 steps between the family room and kitchen. This is my last cookie posting for the time being. I’m going to the Florida Panhandle on Monday for some AF Training and will be back the weekend before Christmas. Yes, I could think of better times to be away from the family, and I will do what I can from Florida in terms of Christmas cards and shopping (yay, LL Bean, Land’s End, Omaha Steaks, Swiss Colony and Amazon!). I’ll start on the holiday newsletter once I get to Florida. Last year I started simply posting the newsletter online, and that will make things very easy to do from 1200 miles from home. I’m not going to waste time going into the legend of the Neiman Marcus cookie. I mentioned it briefly on my initial cookie blog post last month, and simply need to refer you here and you can read all about it. Whether it’s true or not, every time I’ve made these cookies, they’ve been a huge hit and I’m always asked for the recipe. No problem! No big family secrets here! 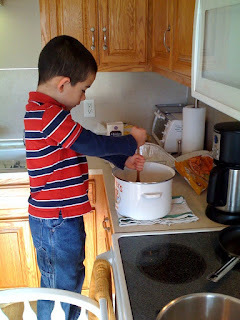 For the photos here (taken around 11/15), I’m making a 1/2 recipe. I did a full recipe on 11/22, and it filled the bowl to the brim when I added the chocolate chips and nuts to the mixer. First you cream the butter and white/brown sugar. I’m a Nazi about this — I set the mixer on medium and let ‘er rip for about 3-5 minutes until it’s fluffy. Then I add the remaining wet ingredients: eggs & vanilla. Beat it to a pulp. So as promised, here’s some more cookie closeups from the Vollmer House. Cranberry Almond Biscotti. This is one sophisticated cookie…cranberries are always so, well, holiday! What’s cool is that the only fat in the cookie is in the eggs (well, the almonds, too, I guess)!!!! So that makes them as healthy as my Holiday Surprise Cookies, right??? This is Patricia (don’t let the Dr. Dave fool you). Tonight we made our first batch of cookies…. …but not flour. There was a great deal on a 25 lb. sack of flour, but I couldn’t see myself hauling it home and taking up so much space in my tiny pantry. Two 5lb. bags of Gold Medal from the commissary was fine. So, the first batch of cookies: Holiday Surprise Cookies, courtesy of the Quaker Oats company. Hit the hyperlink to go to the recipe straight from the horse’s, er, Quaker’s, mouth. So, to start, we have to come up with a filling…this is the “surprise” in the cookie. In years past, we’d used Wilbur Buds, a Lancaster County, PA staple. In fact, the first time I made this recipe was to keep Dave and me from eating an entire bag of Wilbur Buds we’d gotten for Christmas in one sitting, I think. It was either 1999 or 2000…I can’t remember. The beauty of Wilbur Buds is (a) you can buy a combo pack of milk AND dark chocolate together and (b) the buds aren’t individually wrapped. If I’d had the foresight to order the Wilbur Buds ahead of time I would have. But it was much easier to pick up some assorted flavored Hershey’s Kisses from my local mega mart. As can be seen in this photo, we had a lot of unwrapping to do. As the boys were unwrapping about 100 Kisses, in 3 flavors shown here, I was preparing the dough. It’s essentially a sugar cookie dough replacing about 40% of the flour with oatmeal. Look at those oats — your cholesterol is lowering just looking at it, right? Don’t worry…won’t happen: there’s 2 sticks of butter in the basic recipe…and I doubled it tonight! Once the chocolates were unwrapped and the dough was ready, I set up the assembly line in the dining room. The boys were great — Jake stuffed the chocolate in the dough, and Timmy rolled the little ball of dough in the colored sugar and placed the ready-to-bake cookie on the baking stone. My job was quality control — I pre-measured wads of dough for Jake to stuff so they’d be uniform in side, and I made sure the cookies were properly spaced on the stone. Okay, now that I’ve gotten all my political blogging out of the way (see yesterday’s), I can go back to my usual housewife/Mom/Air Force wife-type posts, tee hee. Today I made a trip to Target to get something for my sister’s birthday (I know you’re reading this, Margaret!) I hadn’t been to Target since before Halloween — yeah, almost 2 entire weeks! So of course they wasted no time assembling the holiday aisles right at the entrance, just past the dollar spot bins. Since one of the items I planned to get for my sister was just past the holiday items, we had to pass the holiday items. And then we passed it. It’s part of an aisle dedicated to stocking stuffers. You know what I’m talking about. See the picture above, it’s stuff like that. You know your 2-to-8-year-old kids suddenly lean out of the shopping cart and start pawing at everything on the aisle. Floam, Play Doh, Star Wars action figures, Hot Wheels Cars, Crayola activities, Bratz miniatures, Polly Pockets, candy, puzzles, playing cards. Arranged in bins along the aisle, top to bottom. And that’s exactly what we did. I came home and took $10 out of Timmy’s wallet. I’m not trying to be mean. I’ve been VERY good about not getting the kids toys every time we go to the store. And now that Jake never comes with me to the store, I try even harder to avoid it. And so it begins. For the next 6 weeks the kids’ senses (and mine) will be inundated with the sights and sounds of the holidays. While most of it is wonderful and magical, they’re also going to get flooded with Toys R Us wish books, Star Wars Clone Wars toy commercials, and Pixos ads. C-130 landing at Ramstein AB, Germany for some R&R during a Bosnia deployment, Jan. 1, 1998. 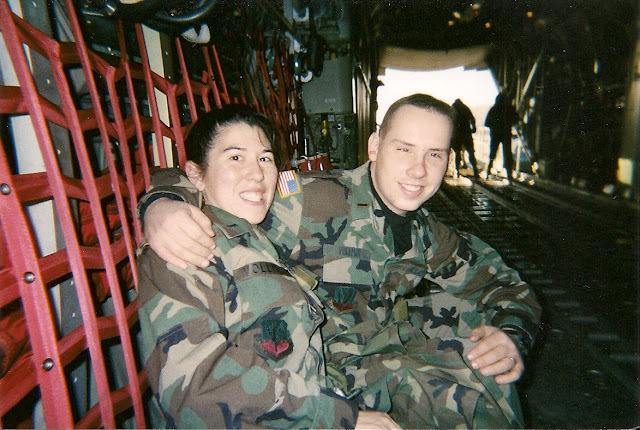 Dave was deployed to Bosnia for an overlapping period of time, but we were in separate locations. First of all, Happy Veteran’s Day! To my fellow Veterans out there, thanks for reading my blog and for serving our great nation. But allow me to stir the pot a little. I posted this NY Times article on my Facebook profile this morning and it generated quite a bit of commentary. I was livid when I read this — I’ve been through enough Public Affairs training in my day to understand that the military’s relationship with the media is a delicate one. If you shut them out, they’ll just come up with their own information and possibly send the American public the wrong message about what the Dept. of Defense is up to. So the DoD’s position is to allow the media as much access as safety and security will allow. This is how we had such great coverage of the invasion of Iraq in March 2003, and also why ABC’s Bob Woodruff and his cameraman were injured by an IED in 2006. (I’m glad they’re recovered!). The journalists are aware of the risks for such media coverage. Anyway, this article claims “senior officials” told the NY Times about some “secret orders” for “secret missions” into Pakistan and Syria to covertly chase down Al Qaeda. I do not know whether this information is true or not. As the Army used to say about speaking about topics unrelated to what you do, “Stay in your lane.” I don’t know anything about this. I’m upset because the media publishing a story full of the word “secret” probably means that America’s people, resources and national interests might be risked. We are not in a vacuum — Pakistan and Syria have now perked up their ears like a dog hearing the word “Walk?”, and even Al Qaeda probably knows this story now and will act accordingly. Go into further hiding, find other nations for safe haven, or otherwise change their tactics. Or…they can go on the offensive, and something bad can happen to those Special Operations forces. And if you REALLY want a good time, delve into the 300+ comments this story has generated. I was pleased to see how many Americans feel that the secret missions were justified, but also horrified by some of the not-so-nice things foreigners had to say about the situation. Bottom line: New York Times, your story was poorly timed and probably put the lives of American servicemembers at risk. And whoever you “senior officials” are, are you sleeping soundly at night?